Of all the civilisations existing in the year 1000, that of Western Europe seemed the unlikeliest candidate for future greatness. Compared to the glittering empires of Byzantium or Islam, the splintered kingdoms on the edge of the Atlantic appeared impoverished, fearful and backward. 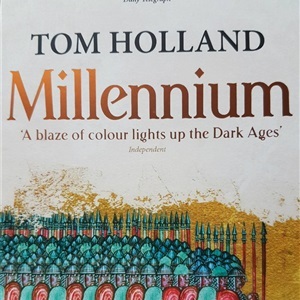 But the anarchy of these years proved to be, not the portents of the end of the world, as many Christians had dreaded, but rather the birthpangs of a radically new order.MILLENNIUM is a stunning panoramic account of the two centuries on either side of the apocalyptic year 1000. 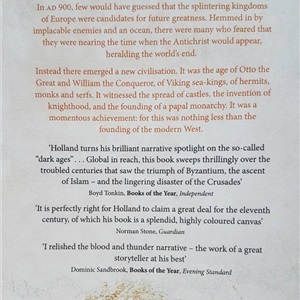 This was the age of Canute, William the Conqueror and Pope Gregory VII, of Vikings, monks and serfs, of the earliest castles and the invention of knighthood, and of the primal conflict between church and state. The story of how the distinctive culture of Europe - restless, creative and dynamic - was forged from out of the convulsions of these extraordinary times is as fascinating and as momentous as any in history.